The UK’s largest fully-connected road infrastructure is about to begin a five-month trial around Coventry, testing technology which will provide more accurate real-time data for drivers, and eventually underpin autonomous cars. UK CITE will test technology enabling cars and infrastructure to share data. It marks the second phase of the £7.1m UK CITE programme, a consortium of industry, academia, local and national government bodies, backed by funding from the Government’s Connected and Autonomous Vehicle Fund and Highways England. Following laboratory and test track work, Siemens has installed a network of roadside units on 40 miles of the M40, M42, A45 and A46, creating a platform for vehicles to share information via short-range communication. This will offer advanced warning of heavy braking, roadworks, approaching emergency services vehicles and traffic conditions, and enable gantry warnings to be broadcast to in-vehicle screens. 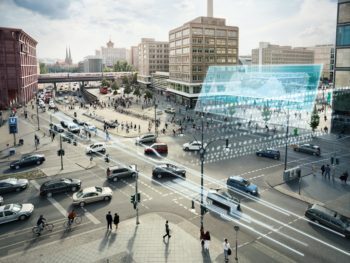 The platform is based on the Siemens Stratos traffic management back-office system, and encompasses a network of 53 roadside units, testing its effectiveness ahead of a wider-scale roll-out which could also allow autonomous vehicles to share data.